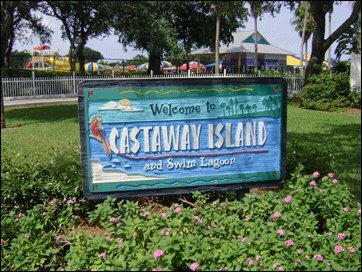 Castaway Island water park is located inside the Topeekeegee Yugnee (this means “gathering place” in the Seminole language) County Park or TY Park for short. This is a favorite spot for families to come together and cool off during a hot summer afternoon. After entering the park, follow the signs to the Castaway Island water park. The road inside is shaded with lots of old trees and winds around past picnic shelters, covered playgrounds, and a large lake with a white gazebo overlooking it. It was the height of summer when we visited Castaway Island water park and the parking lot next to it was packed. I was able to park the car only because I was lucky enough to spot another family leaving. A session just ended and the last 3:30 session was to begin in less than 10 minutes. The Castaway Island water park has actually two parts to it – there’s the water playground and there’s the Swim Lagoon. The entrance fee allows you one session in the water playground area and all-day unlimited access to the Swim Lagoon. If you want another session in the water park, then you’d have to buy another session for each person in your group. The water playground has one large central area with slides. I noticed that the youngsters line up for a chance to go down the red slide, which also happens to be the highest of the playground’s three slides. Careful, there is a step down into the water in most places. There is gradual entry but only on one side of the water playground area. Towards the back of the main water playground is a play area just for smaller children up to maybe 5 years old or so. This is a large wading pool with lots of cute, colorful animals like fish and ducks and slide that looked like a boat. But it was quite clear from the instant they caught glimpse of it that the girls much preferred the Swim Lagoon just next to the water playground. No slides or fancy fountains, the Swim Lagoon is a very large pool with a zero entry on one end and goes no deeper than five feet (about 1.52 meters). As always, there are lifeguards constantly keeping watch. The waterfall at the far end of the pool became a quick favorite. Many bathers crowded at this end just behind a curtain of water and so did we. It was fun listening to the rushing water and watching others on the other side. An hour and a half goes by very quickly and soon it was time to go, but not before ice cream treats from the concession stand. The girls had a lot of fun and so did I! Get to Castaway Island Water Park soon before the summer’s end! Did you visit this Fort Lauderdale water park? Did you have a great time? Share your story here! A concession stand that sells food, snacks and drinks. There were a couple of snack carts selling lemonade and ice cream that were closer to the pool.